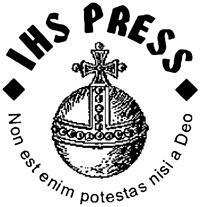 IHS Press is the only publisher dedicated to the Aristotelian-Thomistic social doctrine of the Catholic Church. With its imprints, it advocates a “third way” of philosophical, political, and economic “realism” as the alternative to theories from the “left” and “right” of today’s politico-ideological spectrum. IHS Press reissues works of Catholic social thought (CST) with new introductions and annotations. Gates of Vienna Books republishes books on early-modern through contemporary history. Light in the Darkness Publications offers new manuscripts in the CST tradition. The Schoolmen’s Bookshelf reprints older works of CST scholarship appropriate for use in university courses. And Forgotten Voices Editions makes available, without scholarly apparatus, more obscure older works in politics and economics to provide context and background for titles published under IHS’s other imprints.